Get my FREE mental training e-course and improve your mental game today! 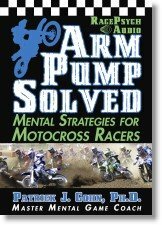 Motocross and auto racing mental training expert, Dr. Patrick Cohn, at racingpsychology.com helps NASCAR, Motocross, and motorcycle racers improve performance and lap times by boosting mental toughness, focus, and confidence on race day. 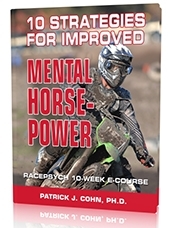 Learn motocross mental training and auto racing driver mental training tips and strategies. In today’s racing psychology session, I offer mental racing tips to overcome choking and improve your training for race day. I help motocross and auto racers take their practice skills to races. Choking causes motocross and auto racers to override the bike or overdrive the car. Learn how to overcome fear of making mistakes and perform with self-confidence in races. Develop a strategy to mentally prepare for a race and improve your mindset. In addition, my motocross strategies and auto racing tips help racers who want to improve performance and boost self-confidence. I help racers learn my motocross racing secrets and auto racing tips to fulfill your potential in races. Listen the podcast on “choking in big races” to learn how to improve your performance with mental skills training! Discover how to quickly sharpen your race focus, boost confidence, and stay in control on the track! Dr. Patrick J. Cohn, sport and racing psychology expert, helps auto, MX, and kart racers to improve mental toughness for racing — and reach peak performance on the race track. Do You Put Other Racers on the Podium?